Sir Peter exudes effective leadership overseeing the biggest and most comprehensive transport system in the world in TfL. He pointed out he runs a ‘mixed economy’; directly managing the Underground, using contractors for the bus network, DLR, Tramlink and Overground and acts as a regulator for taxis. TfL also manages the Red-Route highways. He emphasised transport’s key role in facilitating economic development and social cohesion and stressed the importance of using the business world as an advocate to gain investment and funding. Sir Peter shared three leadership lessons. On taking over as Transport Commissioner he’d set about changing TfL’s culture to one of collegiate and supportive working among the top team from the previous regime of one-to-one relationships which had led to directors competing for the ear of the Commissioner. Having worked for two high profile Mayors with opposing political views it was no surprise the second lesson was to keep politics out of the operational detail of running buses and trains, but Sir Peter candidly admitted he would never have taken the role on if it had reported directly to the DfT, pointing out the benefits of having a committed political champion. 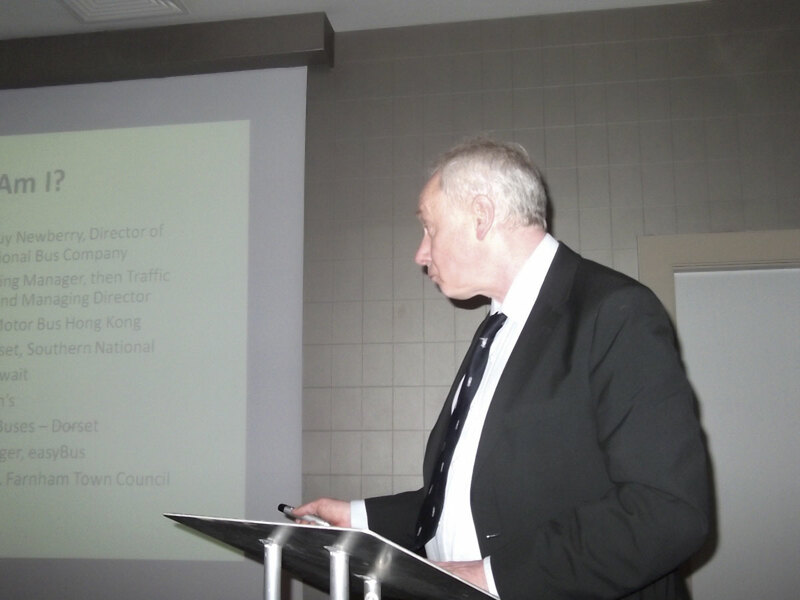 Sir Peter explained how he kept key people informed on detail by personally texting an operational update every morning. The third lesson was inevitably from the hugely successful Olympic experience and how leadership skills had come to the fore as the miracle that is running the Capital’s transport network every hour of every day was effectively stretched to handle this once-in-a-lifetime event. Sir Peter took time out to answer questions including the challenges faced from reduced funding while delivering the Mayor’s high profile costly manifesto pledges. The session got the Conference off to a superb start together with a late evening quiz compiled by Alex Hornby identifying who knew most about Reading and general knowledge. Wednesday’s agenda saw a packed and informative day kicked off by First’s Managing Director for Hampshire, Dorset and Berkshire, Marc Reddy, giving a revealing presentation on the Eclipse brand and busway linking Fareham and Gosport and the rebrand of Zip to Star and investment in a new bus fleet on the Waterlooville to Portsmouth bus priority corridor as well as Hampshire County Council’s aspirations for more busways and priority measures across the south east of the County. Two years into the Eclipse project, the results are impressive. Year two growth of 11% across the corridor (an impressive 22% on the actual Eclipse buses) has followed year one corridor growth of 12% (and an amazing 64% on Eclipse itself). Even more encouraging is 14% of Eclipse passengers used the car. Not surprising when journey times have decreased from 39 to 29 minutes and the frequency has increased from every 7-8 minutes to every six minutes with a PVR of 15 from 12. More bus priority measures are in hand to further improve journey times with a new by-pass to avoid snarl-ups at Fareham’s Quay Street roundabout in May and a southern extension of the busway in the pipeline. At a cost of around £25 million, the busway has undoubtedly delivered a cost-effective solution. Marc recalled the challenges the project faced between its inception in 1998 as a grand LRT scheme incorporating a tunnel under the Solent and its ultimate introduction over 13 years later. This included a favourable Supreme Court judgement forced by a resident interested in preserving bats and Marc wryly noted among the awards the project has justifiably picked up, was the Local Authority Legal Department of the Year 2011. ‘That must have been a bash not to miss!’ he added. 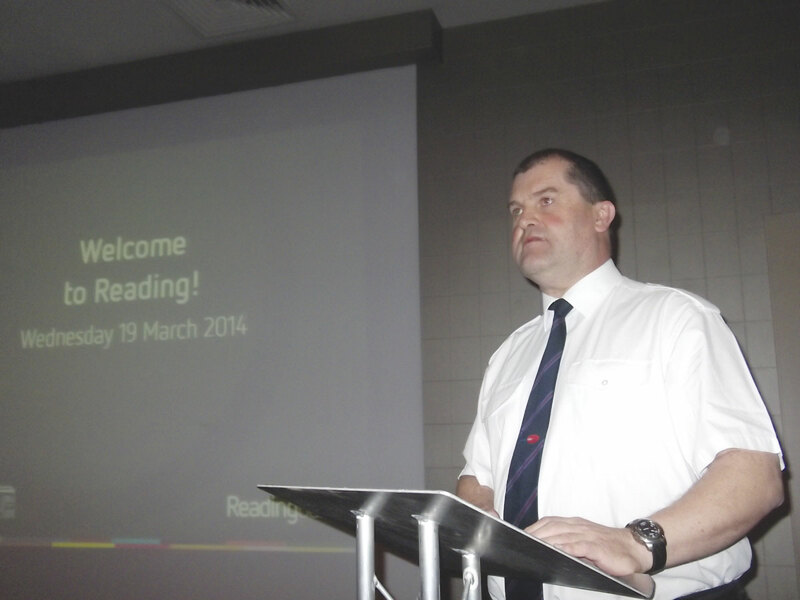 Up next was Young Bus Managers Network co-Patron and Chief Executive of Reading Buses, James Freeman. 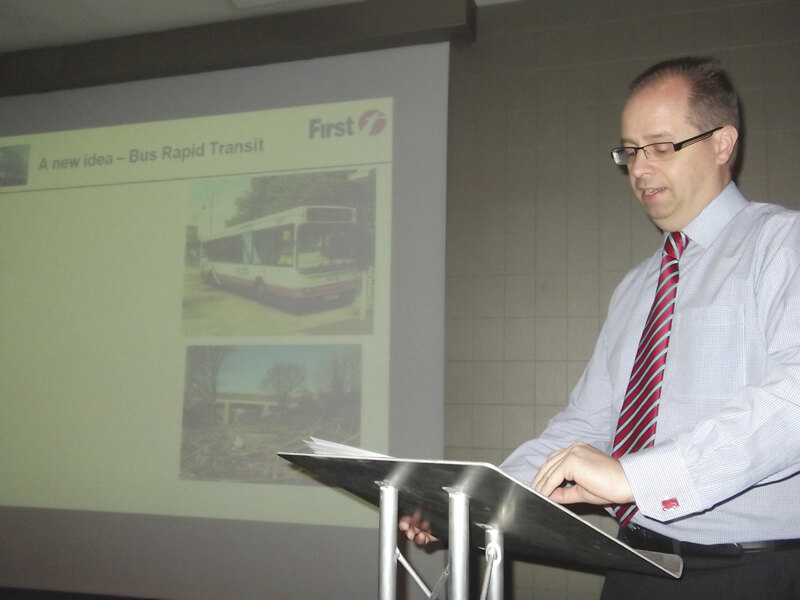 James enthusiastically regaled the Conference with a whole host of initiatives that have made the town’s buses multi-award winning, pointing out no-one attending the Conference was from the dwindling band of eleven municipally owned companies left in the industry. With 142 buses and 470 staff James said the huge advantages of local ownership meant he and the business were locally focussed and fastidious about attention to detail but the disbenefit is the disproportionate overhead cost the network has to bear. He explained how the company doesn’t advertise and instead uses PR relentlessly together with a bright modern Best Impressions designed colourful brand portrayed on the town’s streets. Reading has not been slow at innovation; a low floor fleet as early as 2008, fully equipped with next stop displays (over 60% with audio too), over half have Wi-Fi, and destination repeaters as buses arrive at stops are now standard. Recently Reading has invested extensively in diesel hybrids and gas buses now having one of the country’s greenest fleets. But it’s the staff, James emphasised, that have made the difference and (with his own inspirational leadership) helped the company deservedly win a clutch of awards in 2013. ‘You can have any colours and livery you like, but if the people in your team don’t get it, forget it’ James observed. Reading is fifth in the country’s league of passenger journeys per head and has a 22% modal share in the morning peak helped by a supportive local authority, as ably demonstrated on an hour’s bus journey taken by delegates around the town including a visit to the Company’s headquarters. The Oxford bus story was told after the lunch break with former top man from City of Oxford, David Beaman, giving a fascinating history of the post-deregulation battle from Transit Holdings explaining how it became personalised between Harry Blundred and his former company. David gave a full insight into those early combative times including Transit’s planned foray into Basingstoke which led to Brian Souter planning a retaliatory network of free buses in Torbay. 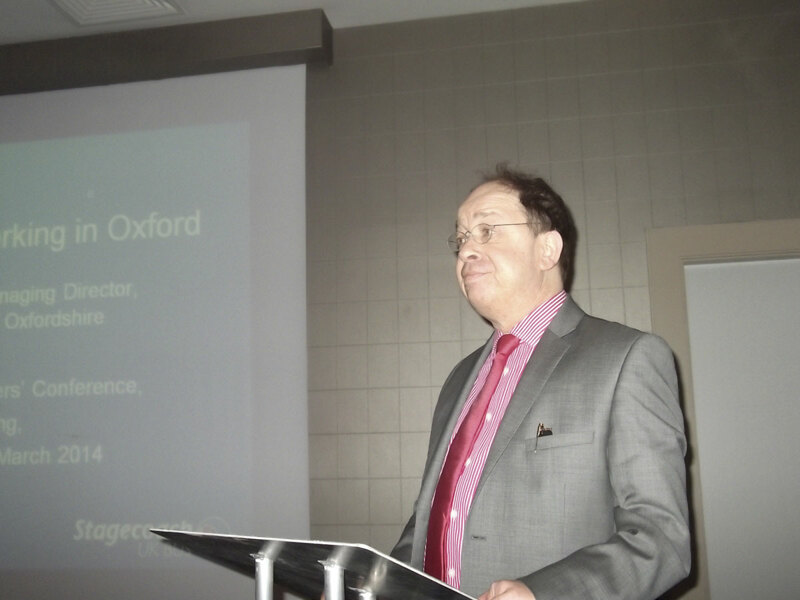 The Oxford story was brought up to date by Stagecoach’s Managing Director, Martin Sutton, elucidating developments since competition had matured and Stagecoach and Go-Ahead had taken over. He explained how Qualifying Agreements under the 2008 Transport Act can mean competitors’ coordinating times and tickets to everyone’s benefit leads to an impressive 50% modal share in the peak. As in Reading, significant investments in the fleet and a supportive and active local authority have also been key ingredients. The Conference concluded with the usual interactive workshop this time facilitated by Centro’s Peter Bond with delegates coming up with their own priorities for partnership working, identifying actions which lend themselves to collaborative working. There had also been time for Austin Birks to encourage membership of CILT with a great six months free offer for delegates and David Beaman explaining the work of the Kithead Trust to preserve the industry’s history. Everyone once again left on a high and looking forward to the next Conference in York on 29 and 30 October.